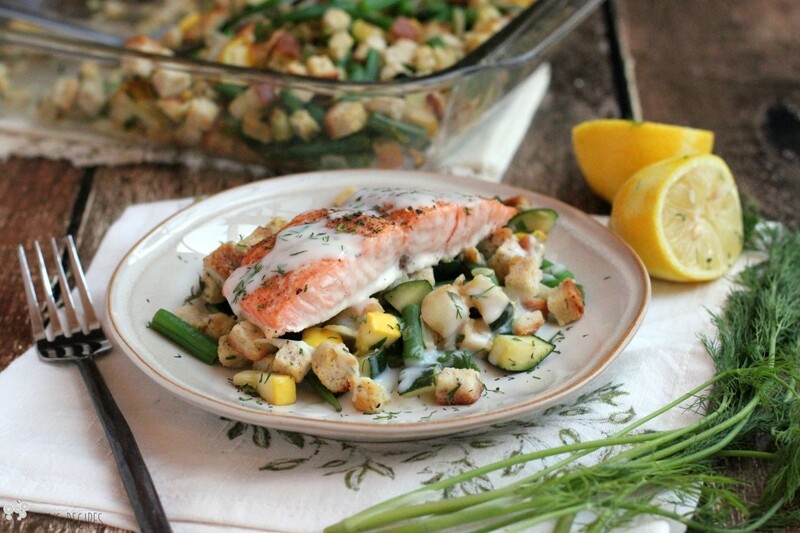 And in the random dinner category, we have this little number, Lemon-Dill Salmon over Summer Vegetable Stuffing. Summer vegetables sing in these delicious stuffing, topped with healthy, succulent salmon, and topped with a cool sauce. This recipe is weeknight easy or fancy dinner perfect. To me, salmon is comfort food, so it’s no shock I used salmon. But I wanted to make salmon even more comforting. I wanted it to give me a hug. So I put a light lemon-dill sauce on it. This sauce was adapted from my recipe here, and it’s fast and easy and perfect for any fish. Yes, there’s butter and flour in it, but you only need a little drizzle so it’s all good in the end. And for this dinner, it was my answer for gravy. I don’t know what the stuffing is about. …Maybe I’m kinda sorta ready for fall, but not ready enough to fully commit and make something with pumpkin. Also, don’t you always feel guilty for eating stuffing? Well, maybe not always (and I will make my Best Stuffing Ever for Thanksgiving), but you have to admit – nutritionally, there ain’t much there. So, I tried to fix that and made a stuffing with no butter and I added veggies. This stuff is so good! I kept it light and fluffy (can one call stuffing fluffy? ), so it really really works with the salmon and lemon-dill sauce. They need each other. 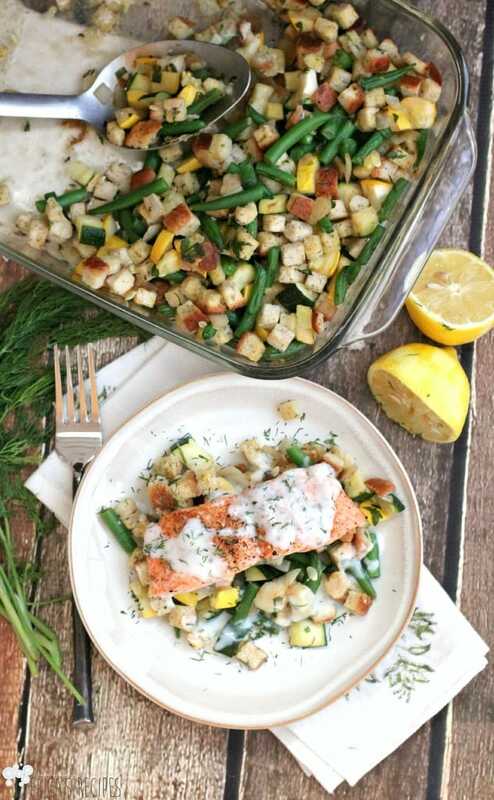 And altogether, this fabulous Lemon-Dill Salmon over Summer Vegetable Stuffing meal made me feel like a creative rockstar and I was sooooo happy my family ate it all up yum. Bring a medium pot of water to a boil. Add the green beans and blanch 1 minute. Transfer green beans immediately to an ice bath to stop the cooking. Drain. Heat 1 T olive oil in a large nonstick saucepan on high heat. Once hot, add the onion and saute 1 minute to brown. Add the zucchini and yellow squash, and saute, tossing occasionally, 2 minutes to lightly brown (you just want them lightly browned; they will finish cooking in the oven with the stuffing). Transfer veggies to a large mixing bowl. Add salt, pepper, stuffing, and blanched green beans. In a small bowl, combine the egg and vegetable stock. Pour over the vegetables and stuffing and toss to combine all the ingredients. Transfer to a 13x9 baking dish sprayed with cooking spray. Cover dish tightly with foil. Bake at 350F for 40-45 minutes until heated through and the veggies are cooked but not too soft. While the stuffing is cooking, prepare the fish. Line a bake sheet with foil for easy clean-up. Lay the fish on the foil. Season well with salt, pepper, and Old Bay. Bake at 350F for 15 minutes or just until fish flakes easily with a fork. To make the Lemon-Dill Sauce, heat the butter in a small saucepan over medium heat. Add the flour and whisk until smooth and bubbly. Cook 2 minutes to cook the flour. Slowly whisk in the milk and cook, stirring constantly, 5 minutes or until slightly thickened. Remove from the heat and add salt, dill, lemon juice, and zest. Taste for seasoning. To serve, put a couple large spoonfuls of stuffing on the plate. Lay a piece of salmon over (I remove the salmon skin at this point - I keep it on for cooking because it keeps the fish from drying out). Spoon sauce over and garnish with a pinch of fresh dill. Yield: 6 servings. You won me over at Salmon, but you completely relaxed me just talking about the homey, give me a hug feeling! And yes you can call stuffing fluffy. Fluffy stuffing is the only kind I like 🙂 This is going on my make asap pile! I don’t care if hubs doesn’t like Salmon, I do and this one needs to be on my plate. Thanks so much for sharing on Foodie Friday! I am craving salmon. And halibut. We just got back from a trip to Alaska and every time we ate out, that is all I ate. You’d think I’d be tired of it, but I just want more. And then I see your recipe!! I wanted to bring some home with me, but I think I am just going to order some direct…I didn’t bring back a souvenir other than my pictures, so that will be my treat to myself! Pinning right now! I am always impressed with your beautiful and creative recipes. Your Lemon Dill Salmon doesn’t disappoint. Looks lovely and sounds delicious. Dill and Salmon is one of my favorites. Thanks you for sharing at Foodie Fridays. Have a wonderful weekend. Awesome recipe for fish. This looks so awesome!!! I can not wait to try this!!! Stopping by from Let’s Get Real. I never cared for Salmon until I hit my 40’s. Now I can’t get enough of it! Love this recipe and I think I have almost all of the ingredients right in my garden! Thanks for sharing! OMG this looks so good! 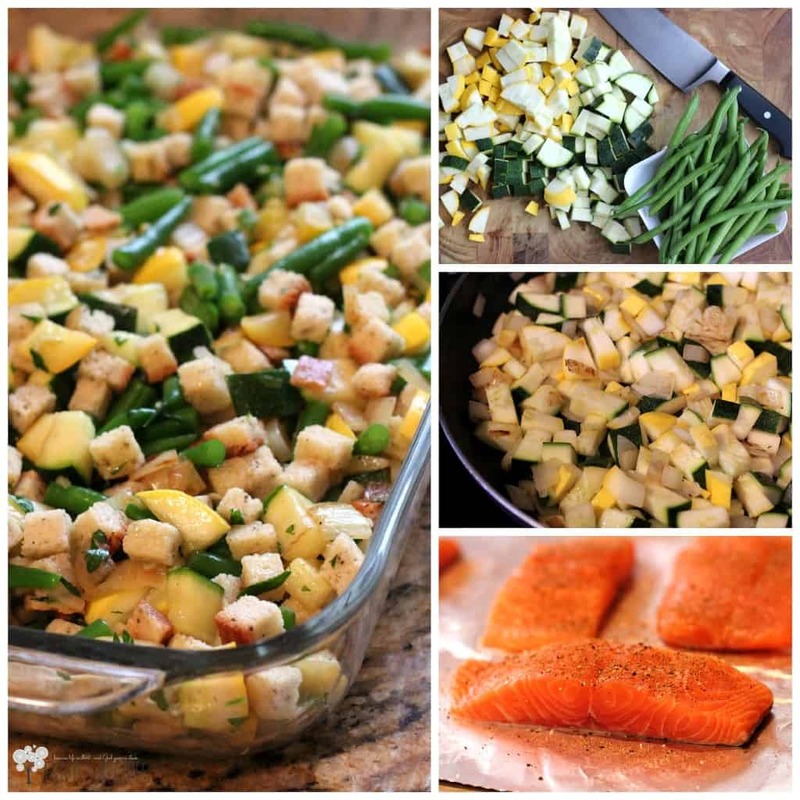 I LOVE salmon….and these flavors and veggies…well, just mmmmmmm! We eat salmon every Saturday and I love to discover new recipes! Thanks for sharing this one and thanks for coming and linking up at The Weekend Social. All posts get pinned in our pinterest board! 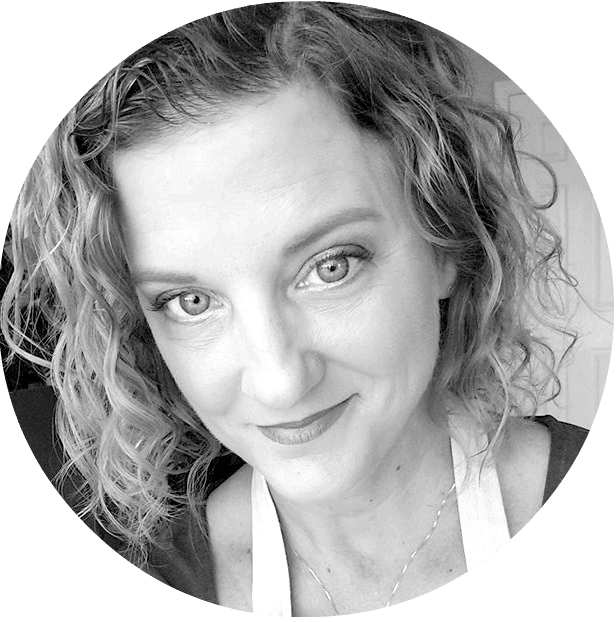 Please be sure to come back next week starting Thursdays at 9PM EST on culinaryflavors.gr ! I hope to see you there! I was out of dill and tried this with 1 1/2 tsp Rosemary instead of Dill and it was FANTASTIC. <3 My husband loved it. Thanks for the recipe! Great recipe. I make a similar sauce, but instead of using flour and milk, I use heavy cream and reduce until thick. I also saute some chopped shallots in the butter. A good way to lower your carbs. This stuffing is going on my list of things to make! It sounds fantastic. I’m not a fish person, but I think my husband would love your salmon recipe too. Thank you for linking up to Tips and Tricks.